While not in the heart of Mumbai, the Grand Hyatt Mumbai is a welcome escape from the hustle and bustle of India’s most populous city. 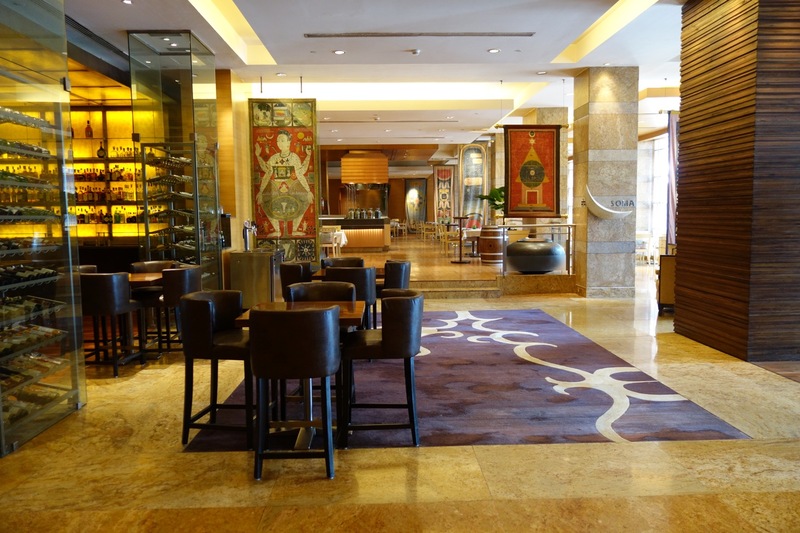 After spending the day exploring Mumbai, I arrived at the Grand Hyatt around 3:00pm, exhausted. I had been unable to sleep the night before and had spent about 10 hours walking around the city. Mumbai, by the way, is a wonderful city. Like so many of India’s great cities, there is architectural and natural beauty, extreme poverty juxtaposed to opulence, and delectable food and markets. The ride from the city center to the hotel took about an hour using Uber. The hotel lobby is quite beautiful: very spacious with a lot of artwork. I quickly checked in and was allocated a room just outside the Grand Club. My room was spacious with a king bed, desk, and semi-open bathroom. The view outside wasn’t great, but the air conditioning worked wonderfully and I enjoyed a great nap. The room included a hot water kettle and minibar. Coffee was available directly outside in the Grand Club. The restroom included a walk-in shower, large bathtub, and enclosed toilet. Bath amenities were from The French Note, a local Indian company. I spent a lot of time in the lounge, partly because it was just outside my room and partly because it was one of the better Grand Clubs in the Hyatt system. Upon arrival, I enjoyed a cup of coffee and some cookies. The evening spread in the lounge was quite tasty, including items like pesto pasta, seafood meatballs, smoked salmon, salads, bread, cheese, and a cold spiced chicken dish. I was in no mood to leave the hotel and just ate enough to satisfy me until morning. It was during this time I had a fascinating conversation with a gentleman named Sanjeev, which I will save for another post. The spread for breakfast was even better, with fresh fruit, yogurts, cold cuts, breads and pastries, as well as a menu to order Indian vegetarian food or eggs. I ate a small omelet with a cup of coffee in the lounge, but saved my appetite for a late breakfast at Fifty Five East, a buffet-style restaurant that offered breakfast selections from around the world. Other restaurants included Celini (Italian / pictured below), Soma (Indian), China House (Chinese), Gourmet Store (deli + bakery), Lobby Lounge (café) and a bar. The well-staffed fitness center offers late-model machines and free weights. The spa, however, was a bit annoying. I appreciated that there was a sauna and steam room (despite the 110ºF heat), but the ambiance was totally ruined by a TV inside the sauna blaring out the morning news. I go to a sauna to escape the news of the day! The beautiful outdoor pools offer refreshment from the heat…but watch out for the birds, which were everywhere. I wanted a hotel to sleep well in as I prepared for my six-segment journey to Paris. This hotel accomplished that goal. One more note. While only 2.5 miles from the airport, the ride at 6:00 P.M. from the hotel to the airport took 45 minutes. I’d fly to India tonight for a Masala Dosa! Looks like a beautiful hotel. I’m so used to staying at the Taj or the Oberoi. I love the water views…. But this looks lovely for a change of scenery. That is a great hotel. I can also personally recommend the J.W. Marriott Sahar which is directly next to BOM. It is newer and another oasis in a busy city. No TV in the Spa there. I agree with you about the Sauna. What were they thinking?? Travel in India can certainly take a lot out of you in a short time, but it is indeed a fascinating place. Good to see such amazing pictures of Grand Hyatt. It is one of the top 5-star hotels in mumbai. And good to see you enjoying the place, food and the other amenities like gym and spa too.